The player controls a young adventurer named Areios. Monsters attack his homeland, and he is forced to flee. After traveling by ship and arriving at the town Bolda, Areios finds out that strange things have been happening in the North Cave near the town. His first mission will be to venture to the North Cave and investigate the matter. Of course, soon Areios finds himself involved in a battle against sinister forces, and commences the longest and most dangerous adventure of his life. The game is an action RPG set in the Dragon Slayer universe, with a gameplay style similar to Falcom's other popular series, Ys. Controlling Areios, the player explores the top-down world, visiting towns and fighting monsters in vast outdoor areas and dungeons. Like in Ys series, it is sufficient to "bump" into a monster in order to inflict damage. Areios gains hit points and becomes stronger by sustaining damage from enemies and resting. His weapons and armor can gain experience and level up. In many areas, companions will join Areios and help him in combat, controlled by the computer AI. The game is divided into chapters; the final stage of each chapter is a side-scrolling/platform level, which Areios has to navigate in order to reach the boss enemy, defeat him, and end the chapter. In such stages, the combat turns into a more familiar action-oriented style, with the player being required to press buttons in time in order to execute attacks and jump. There is a day/night cycle in the game, manifested not only in graphical changes, but also in the schedules of townspeople: when it's dark, people will return to their homes and go to sleep, etc. Originally on PC Engine, this DOS version came out in Korea a slightly higher resolution, and the HUD is displayed as an opaque window to the right but otherwise identical to the PC Engine version. It also found its way back on computers in 2003 as part of the Falcom Special Box 2004. 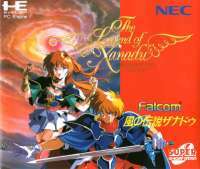 In addition to the game (which is merely an emulated version of the PC Engine version, so it’s exactly the same), it included the entire soundtrack, as well as the Ys VI OST.